I'm developing a security/encryption software and I'm using AES CFB (block size: 16 and key size: 32 bytes). I want to know, if I also keep IV (32 bytes) secret like the key itself (32 bytes), would it add to security or not? Encryption key and IV will not be specified by user, it will be generated and then encrypted with RSA and stored in safe storage. So I'm thinking to generate randomly key and IV. So if I also keep IV and key (both generated) in secure place would it make my crypto stronger or it's preferred to make IV constant in my application code? Actually, for CFB mode, the IV is the same size as the block size, 16 bytes. As for your question "does keeping the IV secret help security", the answer is "not really". CFB mode processes the message in blocks, and for each block of plaintext, combines that with the previous block of ciphertext to generate the next block of ciphertext. What the IV is used for is for the initial block of plaintext; there is obviously no previous ciphertext block, and so you use the IV instead. What this means that if you keep the IV secret, it doesn't really hinder any particular attack in any way. One way to see that is to assume the contrary; let us assume that, if we expose the IV to the attacker, that he can exploit some weakness. If we assume that, then the attacker can use that weakness to attack a CFB mode encrypted text without the IV; what he does is take the ciphertext (without the IV), and treat the initial ciphertext block as the IV, and the rest of the ciphertext as the "real" ciphertext; the plaintext this corresponds to is the normal plaintext with the initial block omitted. Because of this, if exposing the IV with CFB mode lead to a weakness, CFB mode in general is weak. Now, written this way, this might not sound very comforting; however athat statement is logically equivalent to "if CFB mode is strong, then CFB mode with the IV mode exposed is strong", which is really what we want to show. In other words, by examining the bit differences between the two initial ciphertext blocks, he can deduce the bit differences between the two initial plaintext blocks; that is far more information than we want an attacker to know. Instead, you are far better off either using random IVs or possibly using a counter (if randomness is a problem for you). NEVER make the IV constant, it must be unique for every message. The IV does not need to be secret or impossible to predict, only unique. It can be a simple counter, for example. The IV may not be chosen by the attacker. I can not emphasis UNIQUE enough, if your IV is not unique you've basically lost all security. Not the answer you're looking for? 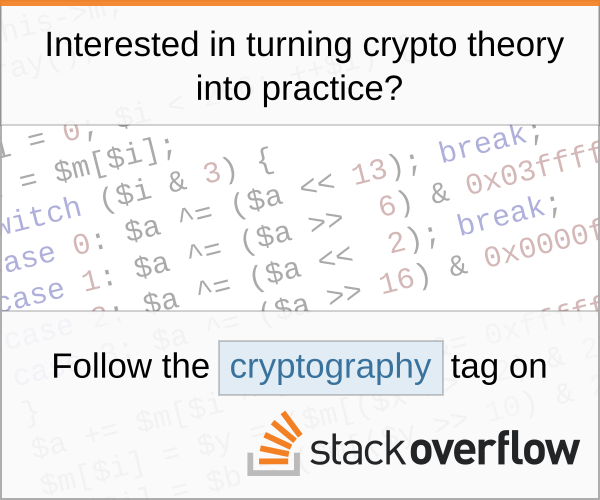 Browse other questions tagged aes block-cipher initialization-vector cfb or ask your own question. Why is the IV passed in the clear when it can be easily encrypted? Will varying plaintext compensate for a fixed initialisation vector? Best way to generate a IV for AES-CBC when encrypting files?